Proving to the cashier that your books are supposed to be 40% off. The folks at my local JoAnn fabrics are great. They are always friendly and helpful, despite not-so-great hours, not-so-great pay, and not-always-so-great customers. When my book purchase rang up at full price, I excused myself from the checkout line to snap this photo of the merchandise display. It was proof enough for her to adjust the prices on my books. Yay iPhone and yay Cashier! This entry was posted in Humor and tagged consumer rights. Bookmark the permalink. This is the first time I’ve ever had to use this technique at JoAnn, but I think Stuart and I have had to do this at Home Despot, as well. 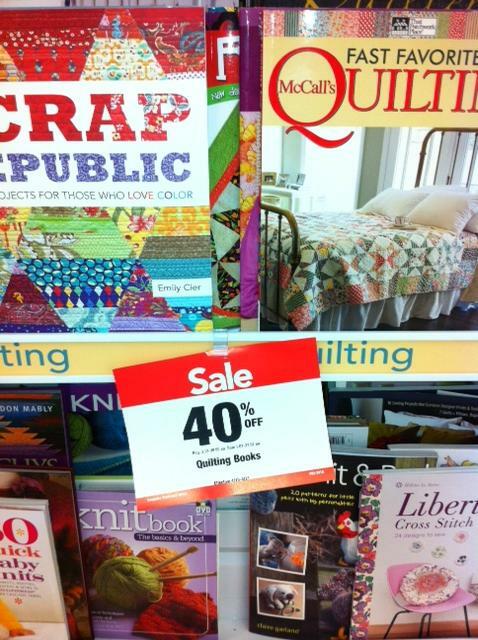 I love that the image is cropped so that the book in the upper left says “crap public”. That is so funny. I didn’t notice it until you pointed it out. Hehe.